We’d love your help. Let us know what’s wrong with this preview of Unusual Events by Max Florschutz. Alaskan adventures. Haunted Hospitals. Something lurking under the kitchen ... stove? Nothing is as it first seems in this new collection of ten thrilling tales from author Max Florschutz. Magic intertwines with the ordinary in five new stories set in the Unusual universe, while in the world of Indrim steam and high fantasy intersect. Elsewhere, men struggle against the el Alaskan adventures. Haunted Hospitals. Something lurking under the kitchen ... stove? Nothing is as it first seems in this new collection of ten thrilling tales from author Max Florschutz. Magic intertwines with the ordinary in five new stories set in the Unusual universe, while in the world of Indrim steam and high fantasy intersect. Elsewhere, men struggle against the elements in the last frontier, a reporter delves deep into the mysteries surrounding her city's heroic figure, and a young man heads off to war for his people. Ten fantastic tales of wonder and excitement. It's nothing ordinary. Flash Point: Life is tricky when you're a high school student. Doubly so when magic may be involved. Monthly Retreat: Life changing events follow Alma in the wake of her trip to South America. Kitchen Creature: Something's lurking under the kitchen ... Stove? Two college students square off against their new, Unusual, occupant. The Graveyard: Come to Hawaii, take a break, tour the graveyards? A Miner Haunting: In light of Jacob Rocke's latest adventure, he ends up in a hospital, sharing a room with a very unexpected—and dead—individual. Ripper: Wrapped in the steam-fueled mists of the Empire's capital city, a serial killer moves against her next target. Vacation: Come see Alaska! Get up close and personal with its myriad wildlife. Very close. Workday: A young teen is dropped blind into a new summer job as a deckhand on a halibut boat. SUPER MODEL: A young women women struggles to be the first to land an exclusive interview with her city's reclusive superhero. To ask other readers questions about Unusual Events, please sign up. I had the opportunity to first get an early look at this wonderful collection a little while ago, and am overjoyed to see it coming out now in a few short days. The couple Unusual stories in this collection continue to flesh out and explore the wonderful universe of Max's previous two published books, and left me wanting to dive even deeper into that universe. In addition to the Unusuals Max's first foray into the genre of the super hero is a great romp with wonderful twists and turns that manage I had the opportunity to first get an early look at this wonderful collection a little while ago, and am overjoyed to see it coming out now in a few short days. The couple Unusual stories in this collection continue to flesh out and explore the wonderful universe of Max's previous two published books, and left me wanting to dive even deeper into that universe. In addition to the Unusuals Max's first foray into the genre of the super hero is a great romp with wonderful twists and turns that manages to stay fresh within a time old genre in a way I can't remember feeling since I first saw The Incredibles. 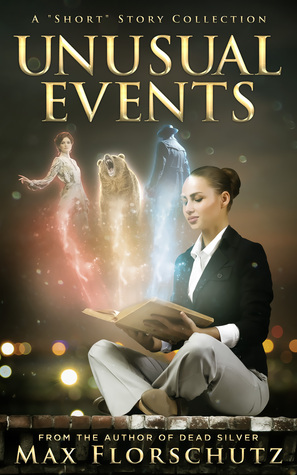 A nice assortment of stories with some being set in the author's "Unusual" universe. The one really dark story is interestingly dark. And there are some good slice of life stories in there, too. Not spoiling anything but, in one story, two men are treed by a bear. :) I'd read more from this author. Max Florschutz was born and raised in the wilds of southeast Alaska, on a little island that boasted both a large, lumber-based economy and one of the highest rainfalls to ever not be desired by humanity. In 2004 he began attending college at Brigham Young University Provo, taking a two-year break to serve a mission for the Church of Jesus Christ of Latter-Day Saints. Upon his return, he continued Max Florschutz was born and raised in the wilds of southeast Alaska, on a little island that boasted both a large, lumber-based economy and one of the highest rainfalls to ever not be desired by humanity. In 2004 he began attending college at Brigham Young University Provo, taking a two-year break to serve a mission for the Church of Jesus Christ of Latter-Day Saints. Upon his return, he continued to attend BYU Provo and began to delve heavily into English courses (among other things), including creative writing classes taught by authors such as Brandon Sanderson. Transferring out to BYU Hawaii to keep a promise, Max finished his degree, graduating in 2011 with more credits than most students would know what to do with and a 3.96 GPA.